Samsung Galaxy Note 5 SM-N920C has received stock Nougat update just a few days back. Only SM-920C received this update. Till now the device was running Android 6.0.1 Marshmallow firmware. Most of the users have already updated their device on latest firmware. But there some who would like to downgrade Note 5 N920C from Nougat to Marshmallow. If you are one of those who is looking to downgrade Galaxy Note 5 SM-N920C from Nougat to Marshmallow then you are at the right place. In this guide we have mentioned the step by step process to downgrade your Note. All you need to do is just follow the steps carefully! Create an appropriate backup of contacts, pictures, videos, songs and other important files stored on your device. Because this process will wipe all the data on your device. Make sure you have more than 60% battery on your device. Since only Galaxy Note 5 model no. N920C has received Android Nougat update as of now, so the following method works on SM-N920C only. Do this process on your own risk. We won’t be liable if any damage occurs to your device and/or its components. Download the Samsung Galaxy Note 5 Marshmallow firmware file from here. Install Samsung USB driver from here. Download Odin PC software from here. Step 1: Download all the files given above using provided links. Step 2: Extract the firmware file, you should get a file in .tar.md5 format now. (You may get 4 or more files, with AP, BL, CP or CSC prefixes). Step 3: Extract the Odin zip file. You should get the Odin.exe file. The program we are going to use. Step 4. Boot your Galaxy Note 5 device into the download mode. To do so Power it off and Wait for 6-7 seconds after screen goes off. Press and hold the three buttons Volume down + Home + Power together until you see a warning screen. Press Volume Up to continue to download mode. Step 5: Now, launch Odin.exe file. Step 6: Connect your device now using USB cable. Odin should recognize your device. When it does you will see Added!! message appearing in the Log box. If you don’t get the “Added! !” message, you need to re-install the drivers again for your device, and you should use the original cable that came with your device. Step 7: Now, load the firmware file. Click the AP button on Odin and then select the .tar.md5 file from above. If you got more than one .tar/.tar.md5 file , then you must be having files starting with AP, CSC, Home_CSC, BL, CP, etc. stuff. Select the firmware files as follows. Next, click on CP tab, and select the file beginning with CP text. Don’t worry if Odin gets unresponsive for a while, it’s normal. Binary size will also show up in Odin. Step 8: Make sure on Odin screen the Re-partition checkbox is NOT selected. Step 9: After doing everything as instructed hit the Start button on Odin to start flashing the firmware file. 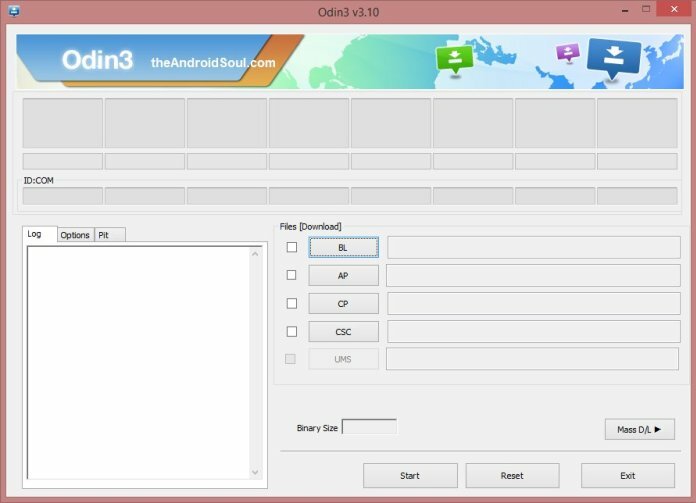 Once Flashing is done, You’ll get PASS message as shown below upon successful installation from Odin. Your device will automatically be restarted and first boot up may take time, so don’t panic. When it has restarted, verify the installation. If stuck somewhere? Feel free to reach us out via comments. I have a galaxy note 5 (sm-n902v). I’ve been rejecting the nougat 7.0 install. I accidentally hit ok, and nougat installed. I lost foxfi functionality and I’m devastated. Marshmallow 6.0.1 has worked great for me. I followed the steps to downgrade but I error out in Odin 3.12.3 I think the version is. Samsung drivers properly installed on computer. When I upload marshmallow file in odin I run the download to the phone. It fails and there is an error message on the phone “Device:3, System:2”. I would appreciate anybody’s help. Are you stuck somewhere? whats the problem you are facing?